It’s jam time! Just as in our house we’re getting through the last jars of homemade jam from last years batches, its time to start all over again. First up; Rhubarb & Elderflower jam. 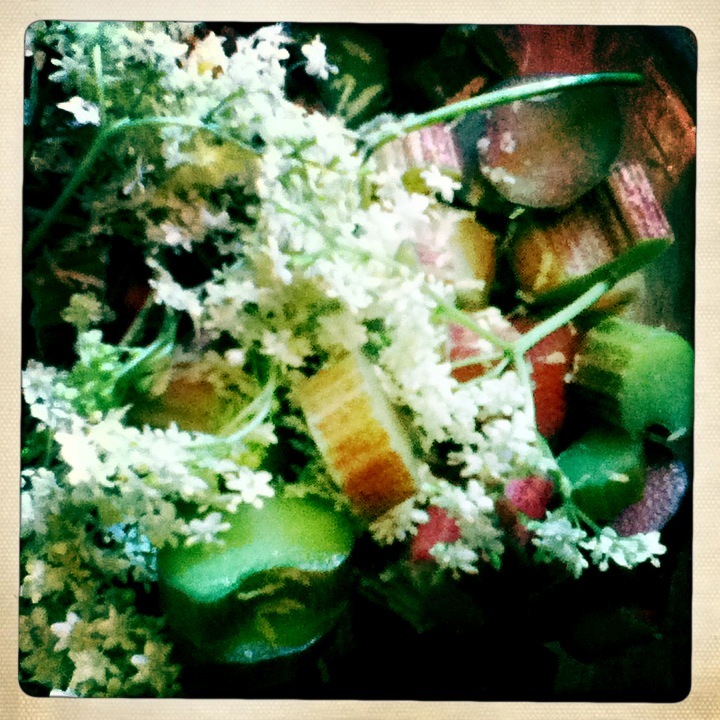 Rhubarb and elderflower is a flavour combination I’ve been meaning to have a go at for sometime. I’ve been coveting an Elder tree at our local recreation ground. Admiring and keeping a keen eye out for its blooms from the top deck of my bus to the tube station everyday. Traditional Gooseberry is the popular pairing with Elderflower, but one in reality I’ve never been able to work. In that my gooseberries are never ready when the elderflowers are out, it just never ever happens! The Elderflowers bloom and fade in a blink of an eye here in London. Which began my thinking about other jammy alternative combinations. My thinking was the fresh sweetness of the elderflower would work very well with another tart ingredient, enter the rhubarb. The results are a floral sweet jam with a lovely pink colour. The elderflowers give a lovely floral fresh taste that remind me a little of rhubarb & custard boiled sweets. Perfect for a scone or fresh slice of crusty bread. Equipment: Preserving pan (or large pan, I use a stock pot), a large wooden spoon, 5 x 454g(1lb) jam jars and lids (washed and sterilised. ), wax discs, jam funnel or Pyrex jug and optional jam thermometer. 1kg Rhubarb (taken from our allotment, variety Victoria (makes a lovely pinkish jam). Around 10 elderflower heads (umbels) Well washed and dry. Don’t want no extra creepy crawlies in your jam! Wash and chop the rhubarb into centimetre chunks. add to a non metallic bowl with all the over ingredients and cover with a tea towel and leave to infuse over night or for at least 7-8 hours. After this time the sugar will have made a lovely sweet syrup. Remove the elderflower heads and transfer the mix the pan. Wash the jam jars and lids in hot soapy water and towel dry thoroughly. Place upside down on the shelf of a low heated oven to sterilise. I heat to around 60-100c. Bring to the boil slowly, softening the rhubarb chunks. Once the Rhubarb has softened, bring to a rolling (a right rollicking and spitty) boil. Attach your jam thermometer if using to the side of pan. As the jam approaches setting point (104c) test if set. Do this by dripping some of the syrup with a teaspoon onto the cold saucer. If once left for a moment to cool the mix wrinkles when touched, the jam is ready. Turn off heat, stir to disperse any frothing. Decant by whatever method you prefer into the oven warm jam jars. I like to ladle the jam into a Pyrex jug and pour into the jars (it’s less wasteful and sticky!). Fill right to the rim and place a wax disc, wax side down on the top of the jam. Place lids on and tighten. Carefull its hot! Leave your jars to cool completely. Ensure lids are tight and store. The jam will be ready to eat as soon as cooled or will keep stored in a cool dry place for 12 months. The Elderflowers egged on by all the sunshine and warm weather this week should be flowering now around the allotment borders. With the dry and warm conditions forecast for this weekend makes perfect conditions for Elderflowers harvesting. So maybe some Elderflower cordial making will be on the cards? Yum, sounds lovely. Have bookmarked, now hope I have time to make it! It’s a lovely combination. Glad I caught the elderflower at there best. Too wet for picking at the moment here. 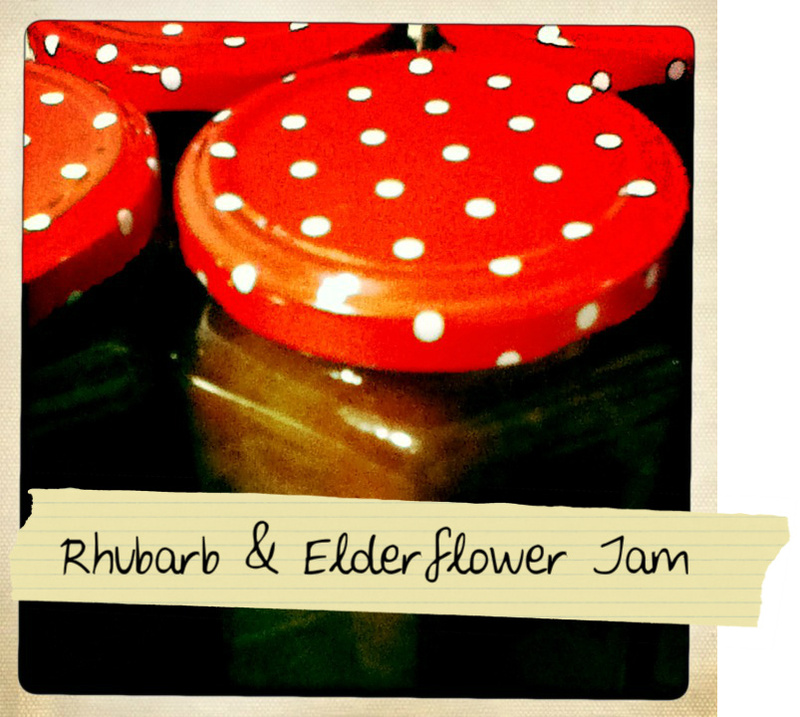 I made rhubarb and eldelflower jam last year, although, at first I was a bit dissapointed with the end product as it was too tart. But I started using as a chutney, eating it with cheese, roasted meats, adding it to curries. Couldn’t get enough of it. Best thing I’ve ever made. Honestly, I think this can be as much a chutney as a jam. In step there is no mention of water and what quantity ? Next Next post: You Look Radishing.